In an oil-rich kingdom, a dictator's bloody rise to power becomes an allegory of our own times in Kuwaiti director Sulayman Al-Bassam's groundbreaking remake of Shakespeare's Machiavellian masterpiece. Grainy TV confessions, sophisticated propaganda, and a wealth of Arabic music and ritual lend themes of leadership, religion, and foreign intervention an uncanny relevance, turning this classic play into a cautionary contemporary tale. 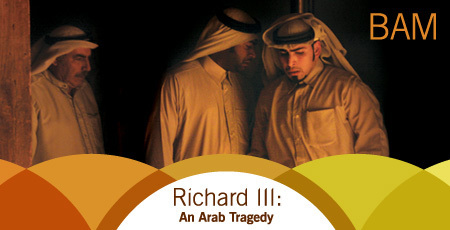 See the video preview and read more about Richard III: An Arab Tragedy at BAM.org. This event is part of Muslim Voices: Arts & Ideas. Presented by Asia Society, BAM, and NYU Center for Dialogues, Muslim Voices is a city-wide festival celebrating the artistic diversity of the Muslim world.